Mie Prefecture (三重県, Mie-ken) is a prefecture of in the Kansai region of Japan on the island of Honshu. The capital city is Tsu. Mie prefecture was created by merging the area of Ise Province, Shima Province, Iga Province and Kii Province. Mie Prefecture is on the eastern side of the Kii Peninsula. 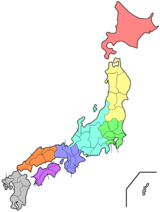 The prefectures that surround Mie are Aichi Prefecture, Gifu Prefecture, Shiga Prefecture, Kyoto Prefecture, Nara Prefecture, and Wakayama Prefecture. National Parks are established in about 35% of the total land area of the prefecture. ↑ Nussbaum, Louis-Frédéric. (2005). "Mie prefecture" in Japan Encyclopedia, p. 628; "Kansai" at p. 477. ↑ Nussbaum, "Tsu" at p. 995. ↑ "Nationwide List of Ichinomiya," pp. 1-3; retrieved 2012-3-13. This page was last changed on 31 December 2015, at 09:00.